Drawing is often perceived as the beginning of an expression, as well as the culmination of a concept, a message, and a story. It may also be the precursor to, the draft of, a finished product; we imagine the artist that first sketches the scene that will become the painting. In the exhibition My Brain Is In My Inkstand: Drawing as Thinking and Process, currently on view at the Cranbrook Art Museum, viewers are invited to dig deeper into the discipline of drawing – to understand it as evidence of a space where thought and action overlap, and continuously unfold into processes, rather than two distinct stages of completion. Presented in five chapters – Translations of Reality, Performative Lines, Controlled Randomness, and Drawing Into Form – this exhibition examines drawing from the fields of art, science, sports, design, and architecture. With works by twenty-two practitioners on display, the traditional notion of pencil-on-paper drawing expands to include furniture design, performance, rock carvings, diagrammatic reasoning, and more. Time and again, the viewer must confront the following question: What happens in the fluid realm between thought and action, and where do these processes merge? This two-fold question is answered in myriad ways – at once seemingly simple and complex, philosophical and mathematical, minute and large-scale – throughout the exhibition space. Tony Orrico at Cranbrook Art Museum on November 15, 2013. Photo courtesy of Cranbrook Art Museum. In Tony Orrico’s Penwald: 4: unison symmetry standing (2009), three large circles composed of intricate scribbles proclaim the artist’s physical investment in his artistic practice, as well as the investigation of a geometric movement. With his body pressed to a blank wall (his canvas) and his arms variously constricting and expanding, Orrico creates large and small scribbles, his markers never leaving the wall. In this form of controlled compulsion, one witnesses a kind of desperate energy to express, explicate, and become one with the process. Although the Penwald series is more meditative, less frenetic than sects of Abstract Expressionist mise-en-abime, or the all-over patterning of Jackson Pollock and Willem de Kooning, evidence of a dedication to this immersive craft nonetheless unites them. In another section of the exhibition, the evocative force of chance is investigated. 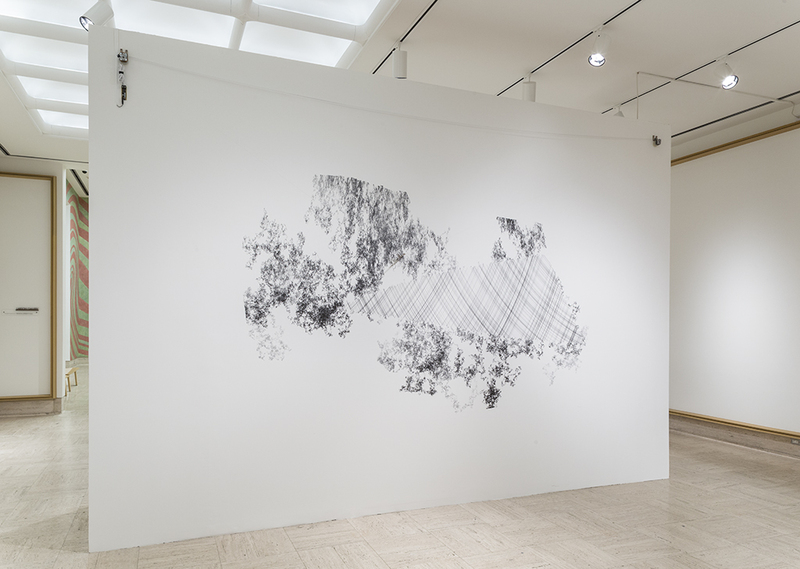 In Tristan Perich’s Machine Wall Drawing, the artist’s body (and hands) literally disappears from the work; a pen connected to a custom-built machine embedded with code scrawls across the paper, creating both randomness (splotches) and order (straight lines). Machine Wall Drawing by Tristan Perich. Photo by R.H. Hensleigh. Another artist in the exhibition, Patricia Johanson, attempts to utilize her craft as a means to solve environmental problems through natural forms. In her architectural drawing, Estuary/Maze House (1978), the shape and pattern of a human brain becomes two physical spaces; in one, a dwelling resembling a tidal estuary, the other inspired by the structure of our own anatomy. In this and other works by Johanson, drawing assumes an outward stance, a curiosity about and conviction for healing and preserving our world with the tools before us. In her practice, the artist works with engineers, city planners, scientists and citizens’ groups to create idealistic designs that could nonetheless function practically as urban infrastructure. These works by Orrico, Perich, and Johanson represent only a sampling of content on display in My Brain Is In My Inkstand, but also reveal a hint of the expansive possibilities to be discovered as the viewer explores drawing as tensile vehicle – an enabler of rich dialogues, process and solution, as well as a visual relationship between the conceptual and the physical. My Brain Is In My Inkstand: Drawing as Thinking and Process opened at the Cranbrook Art Museum on November 16, 2013, and will run through March 30, 2014. Alexandra Kadlec is a freelance writer and editor whose work has appeared in Time Out New York, Chicago Art Magazine, and Chicago DIY Film Magazine. She also currently writes for Revue. 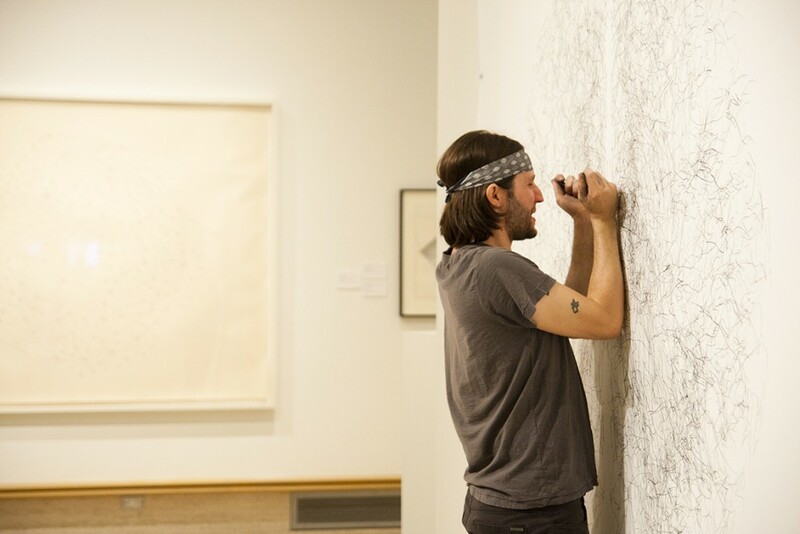 February 25, 2014 | Filed under Art Seen: National and tagged with Alexandra Kadlec, Cranbrook Art Museum, My Brain Is In My Inkstand: Drawing as Thinking and Process, Patricia Johanson, Tony Orrico, Tristan Perich.